Leash training your dog takes a little bit of patience but the rewards are worth it. 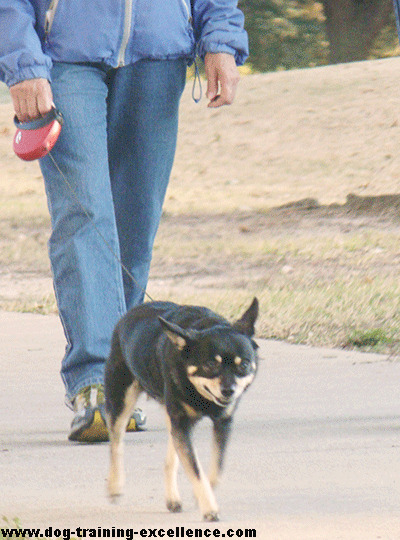 Enjoy a nice walk or run with your pet without having a leash pulling contest! In fact, pulling on the leash is NOT what you need to do. The methods I recommend are positive and fun. Using punishment has many disadvantages and you won't achieve reliability off-leash. Feel free to ask specific questions or leave your comments at the end of the page. You will learn 3 exercises to be done while on walks. Your pet will learn: self control, that walking next to you is rewarding and that pulling on the leash leads nowhere. Read them all before you start! If your pet is completely out of control read our Damage Control article as well as Dog Walking Tips. 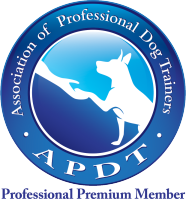 Learn how to communicate with your hound by teaching him the meaning of "good dog" or using clicker training. Teach your pet sit, down, stay and settle. These commands will be useful to work on dog leash training and they will make your walks in the park safer as well. Exercise your canine friend frequently. Play games with him in the yard and take him to dog parks for interaction with other dogs. This will keep him more calm in general. During a walk do not expect your hound to heel the whole time. Heeling is an advance behavior and should only be done in short amounts of time. Walks should be fun and rewarding. Your furry friend needs to be able to explore, sniff around and be interested in things in general. Teach him to ask for permission to prevent sudden pulls to try to chase a squirrel in the park (or any other type of distraction). Never pull yourself on the leash. Your dog will pull and we will teach him not to. But you also need to stop yanking the leash. If you find yourself doing this, try putting the hand that holds the leash under your back. Use a regular buckle collar and a 6 foot leash, non-retractable, for training. This is the best way to teach your dog. Leash training your dog exercise 1: Self control before going out the door. Are you having a hard time putting the leash on because your hound is bouncing like a basketball? Then, to prevent dog leash pulling, we first need to teach him self-control. This is easy but it requires you to be patient and very consistent! You do not need treats for leash training your dog, the act of getting the leash on and going out will be the reward itself! Grab the leash. If your pet starts getting wild, put it back in place and walk away. 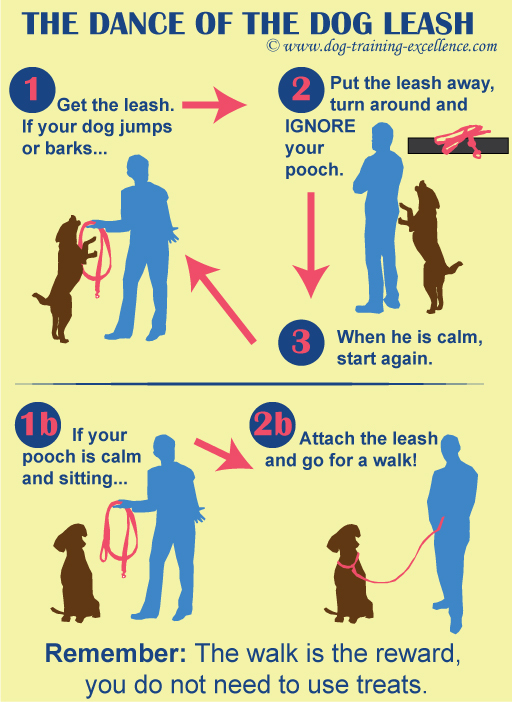 Wait until your pooch calms down, the moment he calms down grab the leash again. If he gets crazy…you guessed it!…put the leash back and wait until he calms down again. 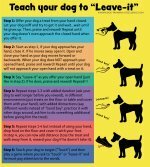 Repeat the above steps until your dog gives up, gets too tired to jump anymore or learns that if he is sitting down the leash will get attached to his collar and you two will go outside. Needless to say, you need to start this with plenty of time to succeed. And you need patience, lots of it! Repeat this every time you go out with your dog and he will learn to sit before his leash is attached. The more times your pet succeeds, the faster he will learn. Tip: To speed up leash training your dog, do 5-10 mini sessions a day. But make each walk outside shorter to save some time (a walk around the block). If you do this, you will also be able to practice the exercises below in short session which is also beneficial. To help your dog achieve self-control faster you can also try the above exercise when feeding him. Ask your dog to sit before you put the food bowl down. If at any point while bending to place the bowl on the floor your dog stands up, start over. Only place the food bowl all the way down when your pet remains sitting the whole time. The first time will also take you a while, so be patient. The more you practice, the better your hound will get at it. And then it will become second nature to him! Leash training your dog exercise 2: Staying close to you is rewarding! This exercise will prevent dog leash pulling by teaching him that staying close to you has its rewards! We will use the dog training method capturing. The idea is to catch your hound doing the correct behavior, in this case walking nicely close to you. Step 1: Have treats with you when going out for a walk, a treat pouch attached to your waist can be very useful. You must bring high value treats! Because you will be competing against difficult distractions (other dogs, cats, squirrels, people, cars, etc). Step 2: Start walking normally, whenever your pet comes near you, Mark and Reward! (or Click and treat!). Step 3: Repeat every time your canine friend comes near you. In the beginning you will have to start by rewarding him for being farther than what you would like (never when the leash is stretched though!). Then you can shape the behavior and reward him for being closer and closer. Step 4: When your dog starts to come close to you more often, you can cut down the treats, only reward (randomly) a few of his approaches and ignore others. I recommend rewarding 7 out 10 approaches (or 3 out of 5). Step 5: In the beginning do many (5-10) sessions, but again make them short ones. 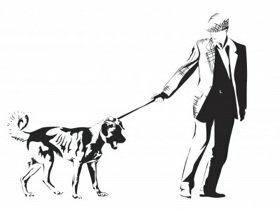 This exercise will not necessarily make your dog walk nicely on a leash, but with repetition and practice your dog will learn that being next to you is good and he will start to do it more often. We are using the principles of operant conditioning. Leash training your dog exercise 3: Pulling on the leash leads nowhere. You have to think about this like a game. You are going to play "Red Light, Green Light" to teach your dog to stop pulling on the leash and walk nicely. Like working on self control, this exercise does not require the use of treats. Being able to continue walking down the path will be the reward. Step 1: Start walking naturally, try a brisk pace. As soon as you feel the leash tightening, STOP (Red light when the leash is tight). Do not pull on the leash yourself! Step 2: Wait for your pet to look at you or loosen the tightness in the leash by walking towards you. As soon as this happens start walking again (Green light when the leash is loose). Step 3: Repeat many times. Be patient, think about it as a game! I recommend you do many short sessions a day (5-10) in the beginning, but keep them short. 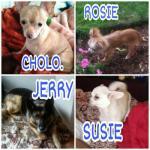 For more dog walking games follow this link! Repetition is the key to success when leash training your dog. That is why several short sessions a day will help you train your dog to walk nicely faster than 1 or 2 long sessions. Try this the first week and as your pet progresses you can start doing less sessions and longer walks. If your dog gets out of control and it is hard for you to even try the above exercises, read Dog Leash Training: Damage Control. Contact me if you have specific questions and contribute your tips below! Enjoy walks with your dog!